Guest houses, Restaurants, Resorts, Hotels, etc can now offer their clients high speed internet access by signing up to a TrueHotSpot. With fast Internet and a fully automated hotspot system, keeping your guests happy has never been easier. 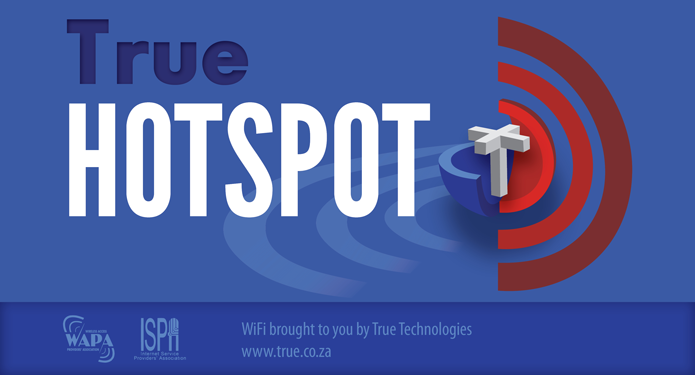 Sign up for a TrueHotSpot at the True Technologies office in Jeffreys Bay (subject to approval and signing of a contract). No phone line/ADSL or 3G connection required! Save up to 40% on calls to national landlines, 20% to cellphones & international calls from R0.25/min. Automated VoIP usage reports per extension with call details like number dialled, duration and cost to you. This will enable you to charge clients for calls made at lower call rates. Calls to other TrueWAN VoIP numbers are free!